Last stop… Indonesia! With over 18,000 islands, it is the biggest archipelago in the world. We had the pleasure of visiting four islands. You could easily spend a lifetime exploring and soaking up the sun and differing cultures of every island. One morning we took off at 3:30 am to climb a volcano (Mt. 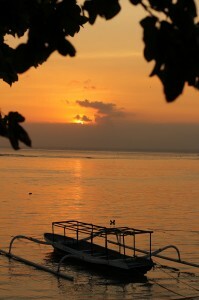 Batur) to get a sunrise view of a larger volcano (Mt. 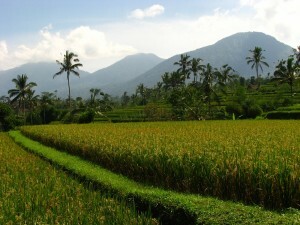 Agung). Unfortunately, our view was obstructed by clouds and fog. Story of our lives when it comes to mountains! 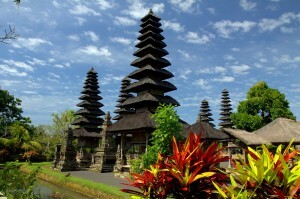 While Indonesia has the largest Muslim population of any country, the island of Bali is Hindu. This means there were more temples to visit! 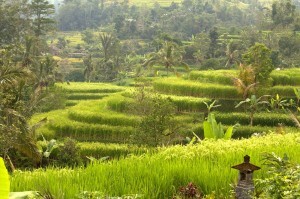 The Balinese are very devote. Their faith was most apparent in the tiny offerings woven from leaves. The offerings may contain flowers, rice, coffee, cigarettes, food, etc. and are usually accompanied with burning incense sticks and sprinkled with holy water. They are set out every day. We spotted them everywhere from outside our bungalow, to sidewalks, and to menu stands. At first we were concerned about stepping on them but then realized this is no big deal. 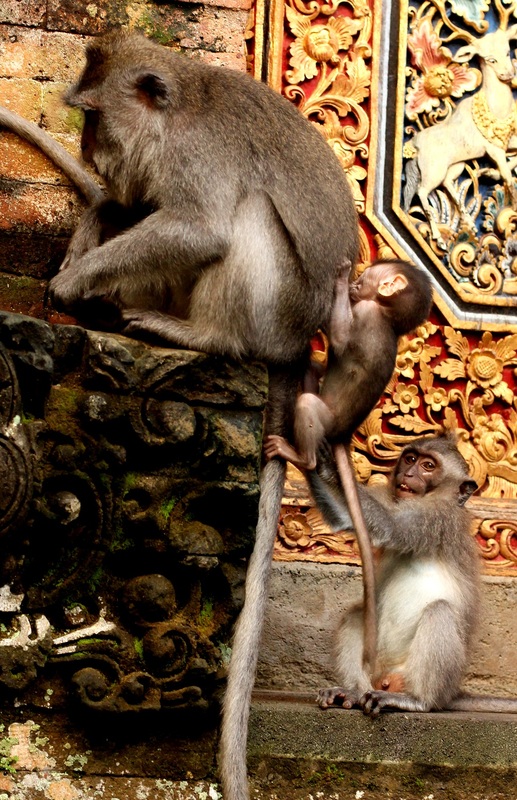 Monkeys eagerly gobbled up the offerings and sometimes even patiently waited in the spots they knew the offerings would be placed. 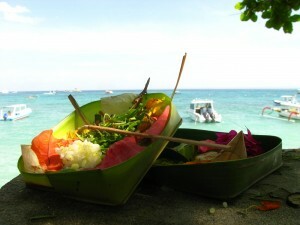 We even saw offerings get swept away into the ocean, day, after day, after day. It was a very interesting ritual to observe. 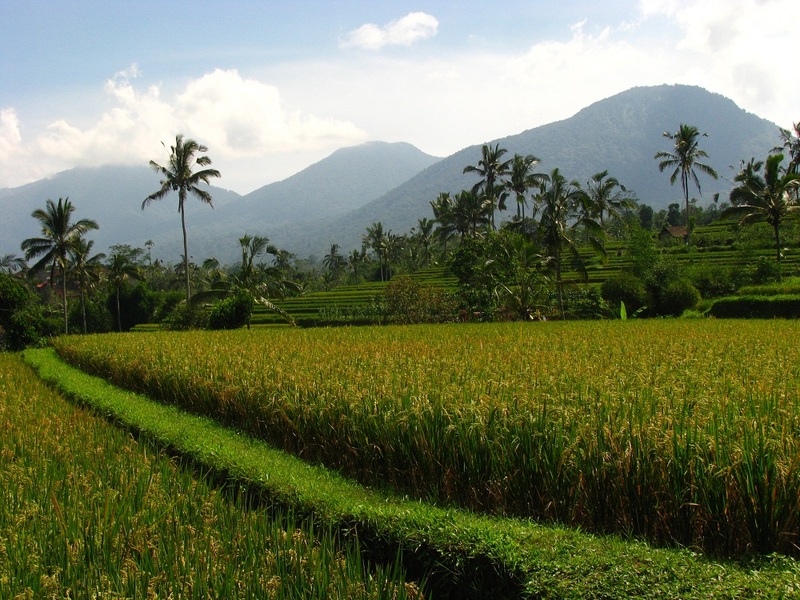 One Balinese man explained to us that his island (right off of Bali) was saved from the tsunami that hit Japan because his island has five Hindu temples. He said it very matter-of-factly. No sarcasm. No righteousness. Just faith. 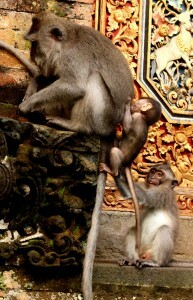 While in Ubud, we stayed across the road from the Monkey Forest. We could not get enough of these playful creatures! The baby monkeys had old men faces (it reminded us of Benjamin Button, who was born looking like an old man) and were not shy at all. While in the forest we saw a few friendly monkeys jump on people! Every once in awhile this resulted in a harmless bite that required a trip to the clinic. 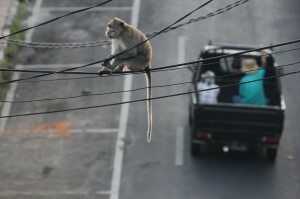 Sometimes the monkeys came out of the forest and into the urban jungle. 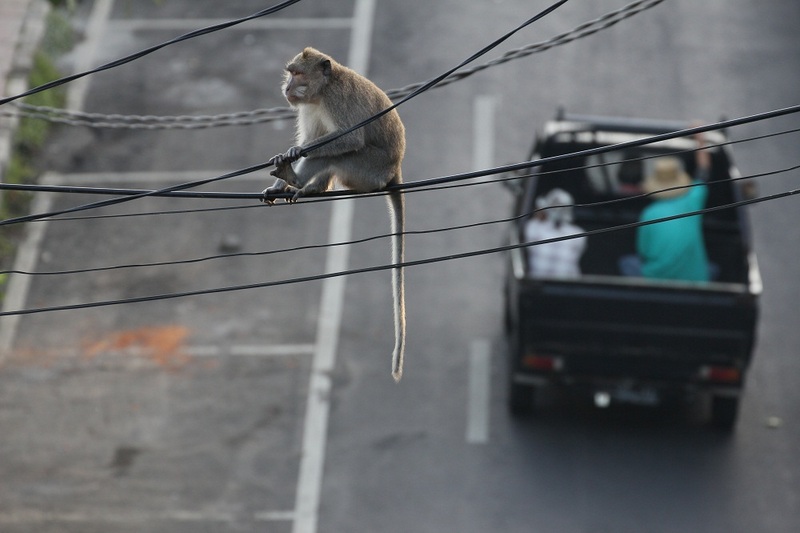 It was entertaining to watch them navigate the numerous cables. 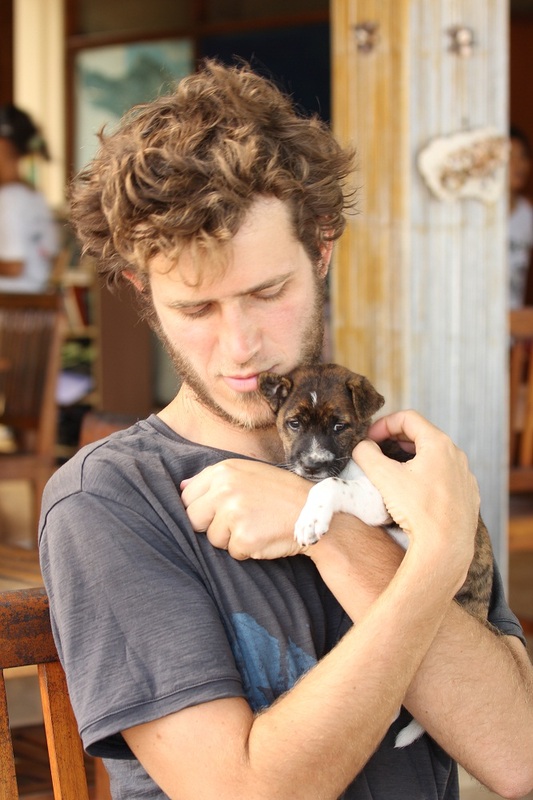 One of our guest house hosts had an adorable puppy; Matt is slowly warming up to dogs! Woohoo! 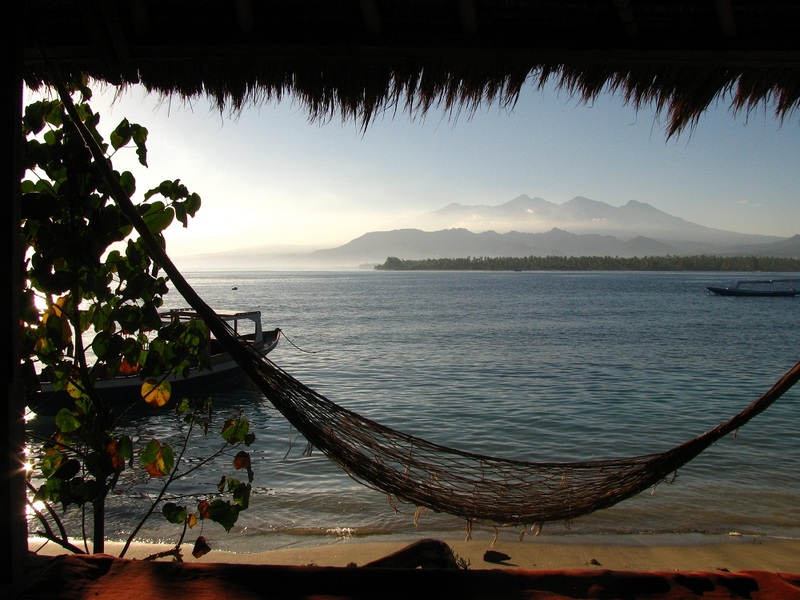 We took a speedboat out to a small island called Gili Air. It takes half an hour to walk across the island, which has no vehicles. 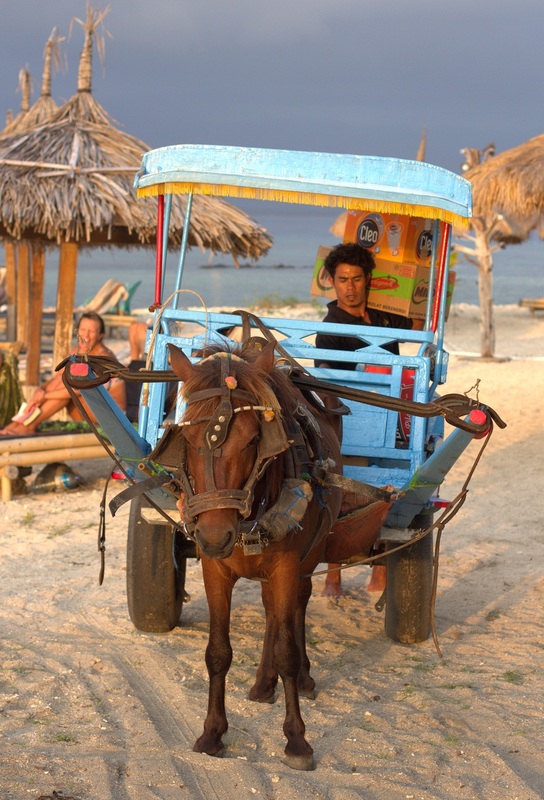 Instead, you can get a ride from a horse and buggy, which is also used to move shipments (of food) around the island once they’ve arrived by boats. Then we were off to Nusa Lembongan, an island southeast of Bali. 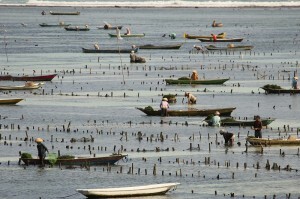 While there we observed seaweed farming! 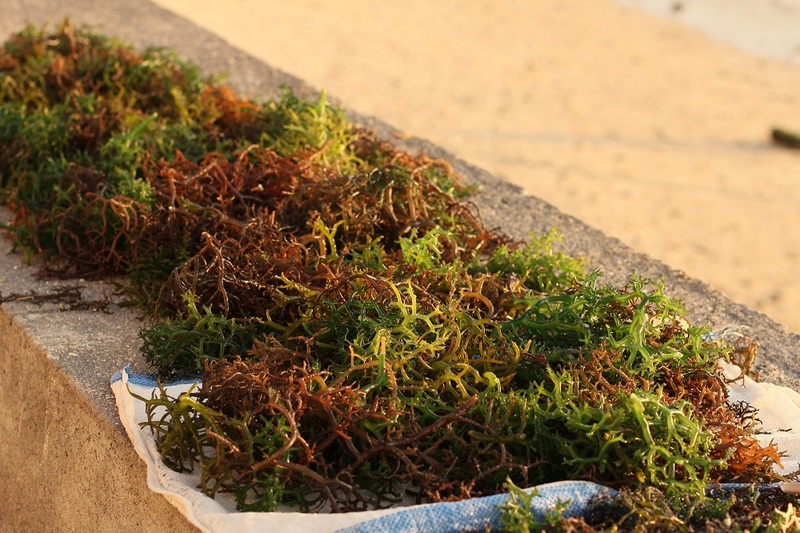 This seaweed ends up in cosmetics and ice cream?! 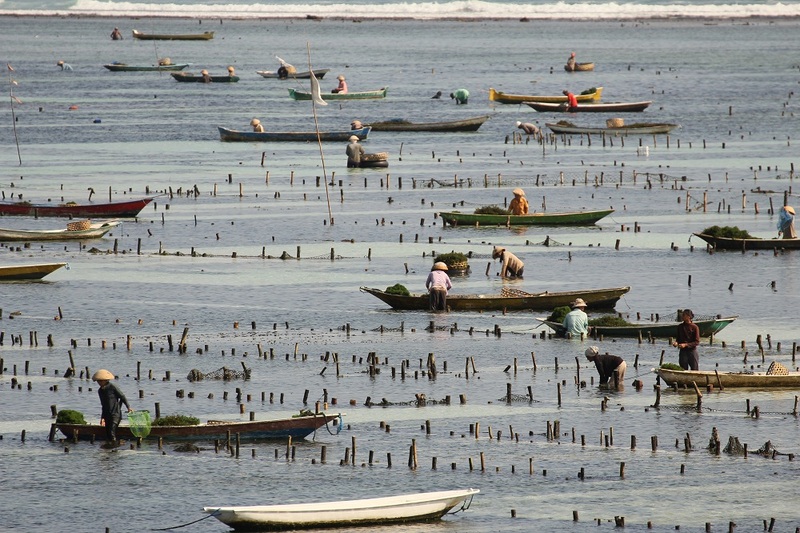 Still not sure about that one… Hundreds of farmers were daily harvesting the seaweed, especially when the tide went out. It looked like back-breaking work. 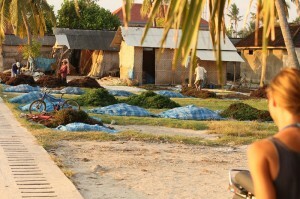 The mounds of seaweed were everywhere! 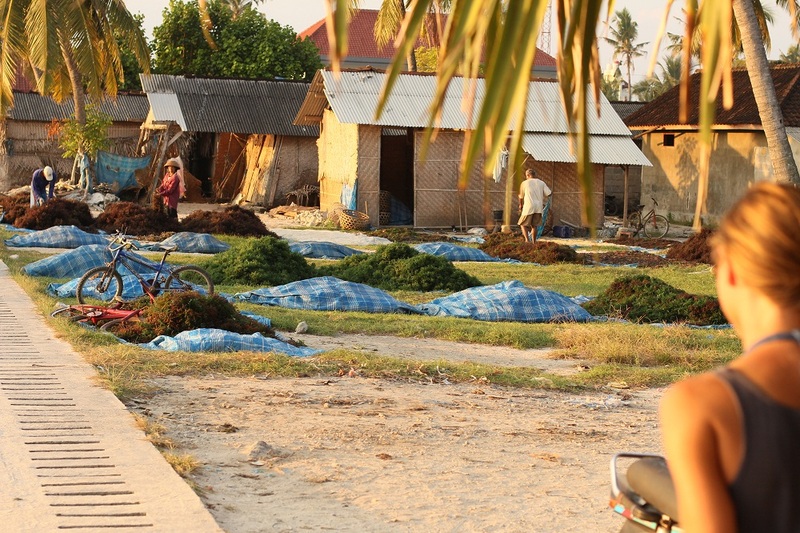 We were told that the price for seaweed is dropping and that farmers currently make 30 cents/kilo. We couldn’t imagine how much work it takes to sustain a family on those prices. 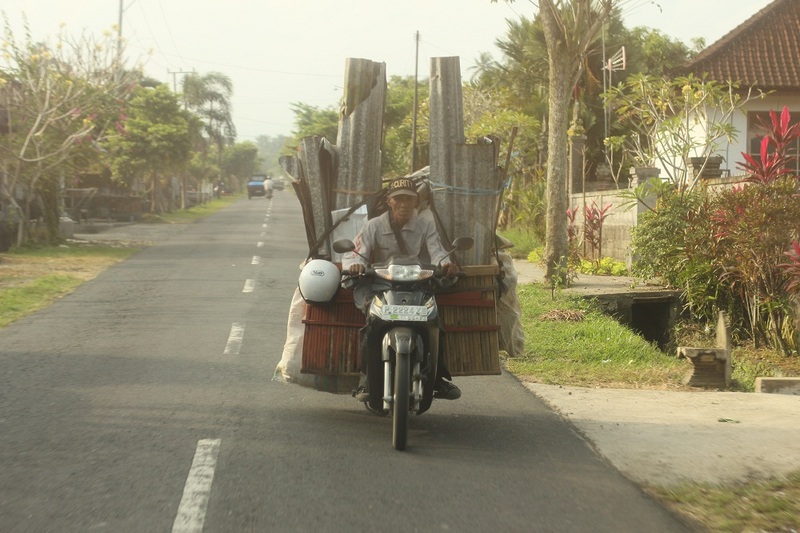 Oh, but we will miss being surprised by what people haul around on their motorcycles! Like all of the hot SE Asia countries that we’ve visited, motor bikes have been more numerous than vehicles. The “organized” chaos still results in many accidents. Every year, a couple of tourists are air-lifted from Bali to Singapore because of motor-bike accidents. One Ubud clinic sees a motor bike accident victim at least every hour. In every corner of the island, we saw people (both locals and tourists) with scabs, bandages, and slings. We refrained from riding motor bikes. 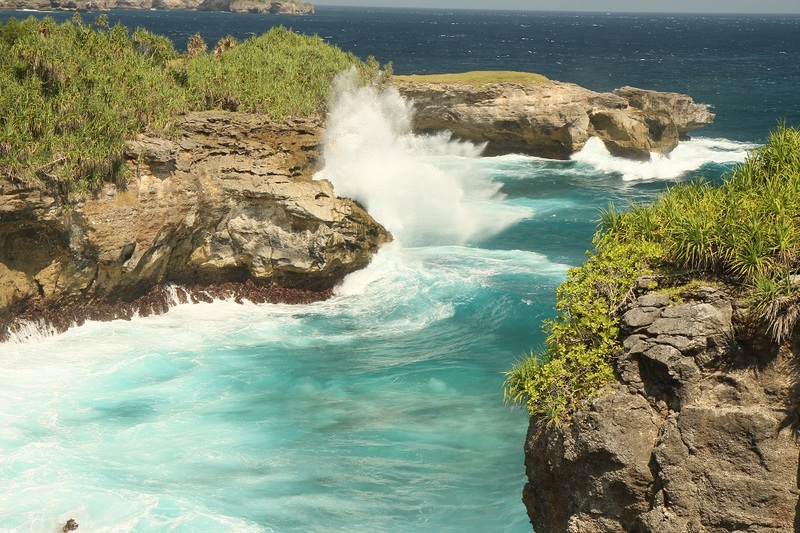 Nusa Lembongan has stunning cliffs with dramatic wave impacts. In ten years we imagine this place will be swarming with resorts and condos. 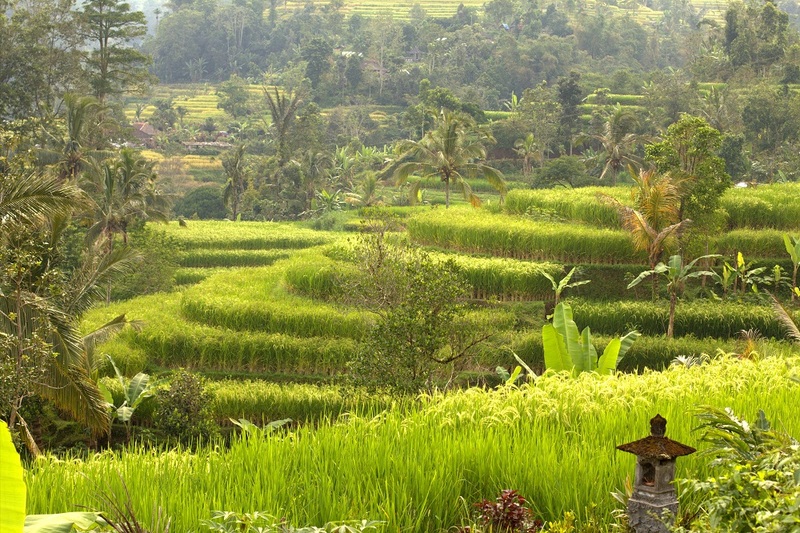 Everywhere in Bali, development is booming. We ended most days with a beautiful sunset. We could not have asked for a better place to end our adventure. Written by: kate on June 17, 2012.on June 20, 2012.